Google reader is done on July 1st so make sure you continue to get posts from Bloglovin' or Feedly. Now on to the weekend. We painted or tried to but couldn't find the right color. We watched movies. The Heat is seriously funny. We walked and then got hot and sweaty. Ice cream happened. I hope you had a good weekend. If you need a suggestion for something to jazz up your Sunday try a S'mores Cookie Sandwich. They won't disappoint. This is not my first go around at banana bread. In fact I have many variations posted already. Banana bread always seems to come up more in the summer time though. Summer because the bananas turn faster than I can eat them. Last weekend my bunch of bananas were yellow and speckled in two days. For a gal who tends to like green bananas this is not a good thing. Unless of course you want some banana bread. Since the bananas were no longer good to just eat banana bread was a must. We had some blueberries too. Why not? A few in the mix and a few on top. Ta-da! Cream coconut oil, add salt and sugar, gradually. Sift flour, measure and sift together with soda and cinnamon. Mash bananas with a fork, beaten until light. Add alternatively with dry ingredients to egg mixture. Gently fold in blueberries, saving just a few to add to the top. Put mixture into a greased loaf pan. Add remaining blueberries to the top and sprinkle with cinnamon sugar if desired. Bake 1 hour at 350 degrees. ***Don't forget that Google Reader is done on July 1st. Follow my blog with Bloglovin so you don't miss any postings. Summer is all about the burger. And although summer technically just started last week, Mr. J and I have already had a least one burger a week for the last couple of months. for this month's Pass the Cook Book Club pick. Each month Kita from Pass the Sushi picks a cookbook from her shelf that hasn't been used in a while. We then pick one of three recipes to make. I went with his signature Crunch Burger recipe. The potato chips might have been the first thing to sell me on this recipe but in the end it was the sauce that had me licking my fingers and wanting seconds. It was one messy burger but well worth the mess. I have plans to use that sauce over and over and over again. The only thing missing here was the milkshake. Whisk together the yogurt, mustard, and horseradish in a small bowl and season with salt and pepper. Cover and refrigerate for at least 30 minutes. Divide the meat into four equal portions. Form each portion loosely into a 3/4" thick burger and make a deep depression n the center with your thumb. Season both sides of he burger with salt and pepper. Cook the burgers, using the oil and topping each one with 2 slices cheese and a basting cover during the last minute of cooking. Place the burgers on the bun bottoms and if desired top with tomato, lettuce, onion, and a dollop of horseradish mustard sauce. 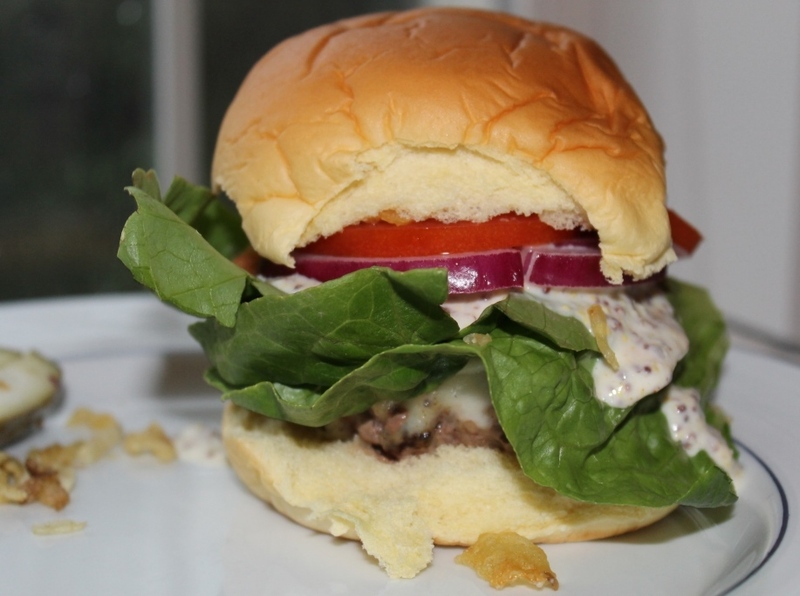 Pile on the potato chips and top with the buns. Serve immediately. Eating in the summer is hard for me. I try to think cool but my stomach just wants what it always wants. Breakfast and lunch aren't too hard but dinner always throws me. What to have without turning on the oven? I was headed up to Albany for an afternoon meeting. 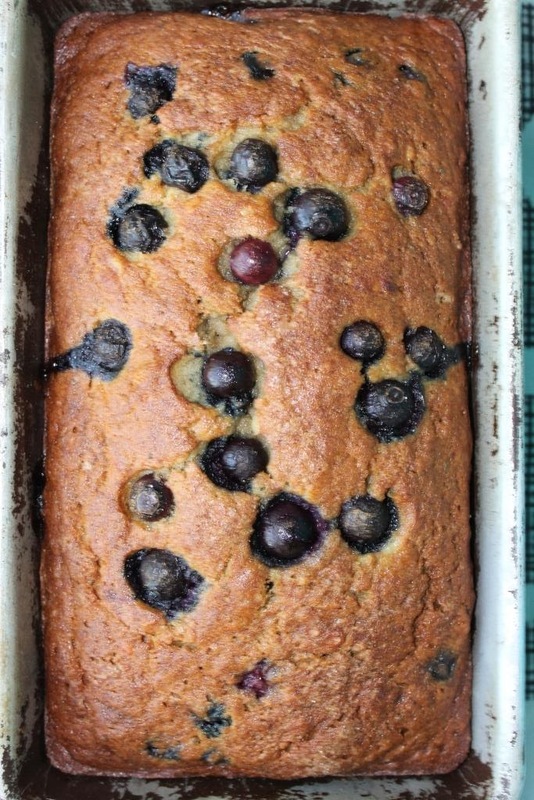 I woke up early to get in a quick work out and then had two slices of banana blueberry bread. One had some peanut butter spread on it, the other Nutella. Blueberries are just starting to pop up at the stores at reasonable prices. This batch tasted so sweet. I had to grab an early lunch before my meeting and it was a good thing because the banana bread didn't satisfy me for long. I got my typical Panera meal of Broccoli Cheddar soup and the Chicken Cobb Avocado salad. I will never get sick of this combination. Corn was on sale at the store so I grab four for the week. First corn of the season. l am from Iowa so my corn selection is pretty picky. These weren't great but not bad either for being so early. Topped with a bit of olive oil, salt and pepper. Grilled. You have to try grilled corn. It is the best! We had grilled boneless pork chops with BBQ sauce along with some Caesar salad. Nothing in the kitchen was turned on. No pots or pans required. Pretty prefect for a meal in the summer. We ended the day with a big cookie and a glass of milk. How do you cook in the summer to stay cool? Yes I did. And I have no apologies. Two ingredients. Nutella. It is something marvelous. Mr. J described it has frozen Ferrero Rocher candies. I will stick with heaven. The consistency is smooth. Right out of the ice cream maker it reminded me of a Wendy's Frosty only with Nutella flavor. Note to self: next time eat it right out of the ice cream maker. I made this in an ice cream maker. I am not sure if it would work by just freezing the liquid straight in the freezer. It would be worth a try though. I cannot imagine it being bad. And this dessert requires no additional toppings! 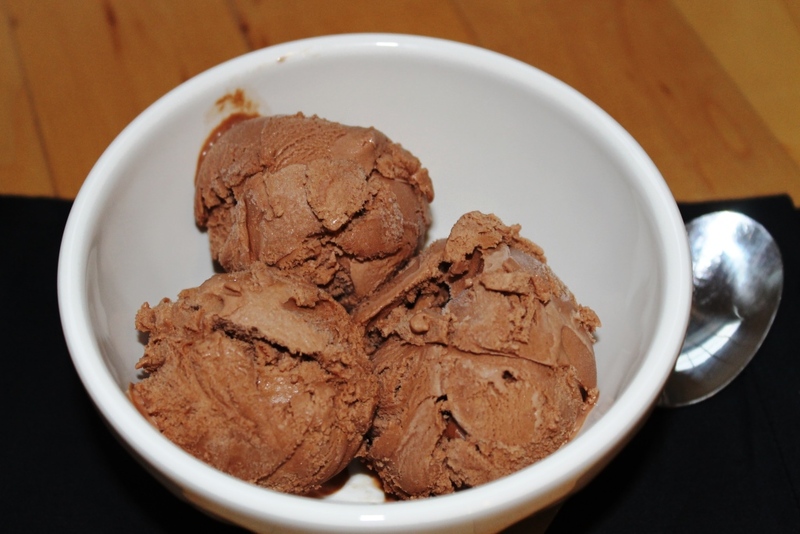 Freeze the bowl of your ice cream maker according to the manufacturer's instructions. Combine the chocolate hazelnut spread and the evaporated milk in a medium mixing bowl, and stir with a whisk until they combined and the liquid is smooth. Whisk again and churn in your ice cream maker for 15 minutes (or according to manufacturer's instructions). I feel like I am on repeat every month when I say I cannot believe it is the end of the month. June flew by. How is the 4th of July right around the corner? I am trying to enjoy every moment but it seems like time is just slipping away. This month for the Secret Recipe Club I got Natural Noshing. I have to say I am bit jealous of Nora. She has a frozen yogurt store. I mean, seriously. Can I be you for a day? Normally I have a hard time picking which recipe to make. I spend a few times going back and forth between two or three recipes. This month though I really just jumped right in. See it has been hot. I don't deal so well with the heat. Basically in the summer I live off of ice cream and all things cool to eat. When I saw a section for smoothies. I was sold. 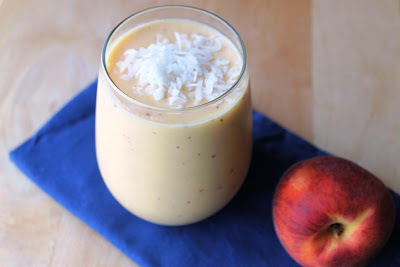 The triple berry pomegranate smoothie almost had me but the peaches lately are amazing at the store. You know the ones that when you bite into the flesh rivers of sweet juice starts running down your chin. We had a bowl full of them staring me down from the table. Thus the peach mango lassi won out. This was a great afternoon snack when the temperatures were 90 degrees and the humidity was just as high. You get subtle hints of the peach, mango and coconut for something that is very cool and refreshing. I left the skin on my peaches and you can see the little specks of color. Add mango, peach, yogurt, coconut milk and ice to a blender and puree until smooth. Pour into glasses, garnish with fruit cubes and shredded coconut. Do you see all of this lush greenness? That means the weather has been cooperating a bit more this past week. Lots and lots of sunshine. Funny how last year the green beans would not grow at all. This year they are the best looking plants out there. Those and the massive zucchini plant that has taken over. We better get some nice looking squash out of that sucker. The tomatoes are just starting to poke out. We have four different varieties and I cannot wait to see which ones are the best. The other bed is not so full but has lots and lots of herbs. The parsley plant is now a bush. Made so many flavorful meals this weekend with fresh parsley. It was great to be home this weekend and just rest. Mr. J and I tackled a few small home improvement projects. Can they be called home improvement if we rent? Crazy how much you can do with $20 at Home Depot. We put up a new utility shelf for random "Man" things and an extra towel rod in the bathroom. We also changed out 3 light bulbs. Apparently it was time for them all to go out. OMG! TGIF! I am so happy Friday is here. The days this week have been short and long all at the same time. Lots to catch up from after being gone for vacation. It was only four days but man did things seem to pile up. When we were gone I REALLY wanted nachos. Mr. J was extremely happy about this because he REALLY wanted to go to the ESPN Club on the Boardwalk at Disney. Not my favorite place with so many other fun options at Epcot next door but the hinting of nachos had me caving to his request. But when we got there the menu had changed from our last visit. 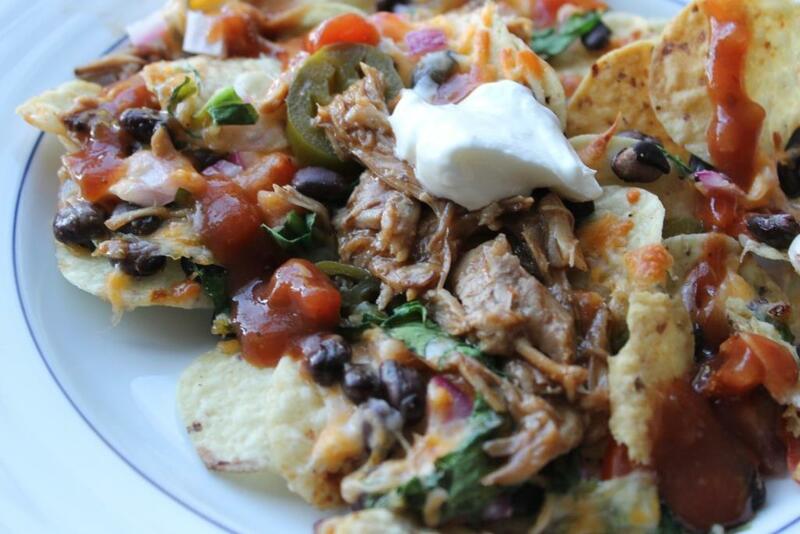 Their appetizer nachos were now topped with pulled pork. I wasn't opposed to the idea but the nachos I had in mine were plain old beef topped cheesy goodness. No BBQ sauce in mind. I ended up with a sandwich (I should have gone for the nachos.) but the idea of pulled pork nachos stayed with me. It didn't take long to decided that we had to try them out. I made pulled pork from the Slow Cooker overnight with a super easy recipe. Dinner was easy to whip up come 5pm. Yes, we really eat at five. We lightly piled tortilla chips with black beans, red onion, spinach, tomatoes and cheese. Then we baked them on the lowest rack of the oven at 400 degrees for about 15-20 minutes. When the cheese is all melty remove from the oven and top with pulled pork. Not the typical nachos but oh so good. I am back. And what better way to celebrate than with some sweet treats. As much as I love cookies sometimes bars are much easier to put together. There are so rich and dense packed full of lots of peanut butter and peanut butter chips. I am bringing them to a potluck at work today. Too scared to keep something so tempting in our house for long. Of course I had to sample a bit before sharing with others just in case they didn't turn out well. Nothing like a dessert at 6am. Mr. J also wanted to get into the action. Is there such a thing as an appetizer to breakfast? What do you like to bring to a picnic or potluck? Preheat oven to 350 degrees. Line an 8-inch square baking pan with foil so that the foil comes up the sides of the pan and overhangs slightly. In a medium saucepan over medium-low heat, melt the butter. When it's melted, remove the pan from the heat and whisk in the sugars and peanut butter until the ingredients are all incorporated. Let stand to cool slightly, about 5 minutes. In a large mixing bowl, whisk the eggs, then whisk in the vanilla. When the peanut butter mixture has cooled, stir it into the eggs until smooth and incorporated. Stir in the flour and salt until incorporated, then stir in the chocolate chunks and peanut butter chips. Spread the batter in the prepared pan, smoothing the top. Bake for 30 to 35 minutes, until just set. Place on a rack to cool. When the brownies are cool, turn out onto a cutting board. Peel off foil, turn brownies over, and slice into 16 squares. Brownies will keep for several days stored in an airtight container.